As Mother Earth continues to weather the storm of Ascension in the duality of the 3rd Dimension, the Human Collective Consciousness continues to fluctuate wildly between the darkest negativity and the highest vibration of unconditional love. Humans who are sensitive to the energy of others are finding that they can be joyous in mood one day then desperately depressed the other. For many, finding an equilibrium in the disorganised and unpredictable mix of discordant/violent/love energy circling the globe is an impossible task. For the awakening and enlightened, the powers of the Violet Flame of Transmutation are an absolute necessity, if they are to continue their work of helping others to raise their vibrations and consciousness out of the mire that is the 3rd Dimension. Amongst the masses, the Violet Flame is unknown and untouched, yet in Wayshowers’ and Lightworkers’ circles the Violet Flame is an important tool for the survival of Humanity. When the Violet Flame is called upon, it will instantly transmute any negative emotions, feelings and vibrations into love. The sparks of golden light signalling the transmutation are automatically sent out to the world, creating a love vibration that resonates with that of Mother Earth. Because the Flame comes from and is one with the Earth, the effects upon Mother Earth are immediate, causing a ripple effect that goes far beyond the area where transmutation occurred. The Violet Flame is of the Seventh Ray, which is the overlighting ray of the Age of Aquarius and is radiated by Archangel Zadkiel and his Archeia Holy Amethyst. As the name suggests, the amethyst crystal is associated with the Violet Flame and is used by crystal healers to absorb and transmute negative energies in the home and in personal or sacred spaces. The colour violet is that of the crown chakra and the seventh ray and is therefore the highest healing colour in the spectrum. When used consciously by humans to transmute toxic feelings of hatred, anger, resentment, jealousy, depression and spite, the positive effects on personal relationships, on negative workspaces and on collective or group consciousness are noticeable and far-reaching. As the attempts of those who wish to rule the masses with fear. terror and violence drastically increases, the daily use by lightworkers and the spiritually aware to transmute their own negative energies as well as that in the collective consciousness is critical to the ongoing ascension of the planet. Archangel Zadkiel/Holy Amethyst, Saint Germain and any of the Masters of Light can be called upon at any time to assist you to call up the Violet Flame whenever the need arises. WE urge you to be proactive in this cause. WE ARE Archangel Michael and Saint Germain. In the physical world there are limitations; on lifespan, movement through time and space or on knowledge. Humans feel hindered by what they don’t know and feel they only have so many options available to them when it comes to accessing knowledge either from the past or that still remains hidden or unknown. In the ethereal kingdom, however, the possibilities are limitless and there are no boundaries on movement through time and space; all is available, should one believe it and avail oneself of it. All it takes is belief. Humans are spiritual light-beings learning lessons in a physical body in the third dimensional reality of planet Earth. When their body dies, their spirit is released back into the light of Creation from whence they came, carrying all of the knowledge of their past existences with them. The soul carries the spirit from lifetime to lifetime, gathering wisdom through every lifetime until it reaches the stage of mastery, after which the soul is released from the karmic wheel and rebirth back into a human body is thereafter a choice, not a mandate. At this time, many masters of varying ages are walking the planet Earth in human form in a last-ditch attempt to bring the human consciousness to a state of oneness. Whether they are successful or not depends upon the ability of individuals to see beyond the physical body and to awaken to their own divinity. The conscious mind sees only what is before it and remembers physical experiences from its current reality. The sub-conscious mind, however, is in touch with the spiritual body and sees, remembers and accesses memories from other lifetimes and other worlds. It is readily able to shift from reality to reality, paradigm to paradigm, dimension to dimension, potentially leading to profound dreams and an awakening of the person’s psychic abilities. This ability may, however, be extremely disturbing to the individual who is blocked by the physical reality of their existence and serve to shut their minds down to the possibilities that have been shown to them. This choice is always theirs and cannot be intervened upon by anyone, human or otherwise. Accepting one’s Divine Blueprint can only occur when one can see beyond the physical existence on Earth. Belief systems can be so indoctrinated in a person, usually from a very early age, that a soul who incarnated with the intention of awakening to their own mastery remains blocked for their entire lifetime, ultimately missing out on the opportunities available to them and on making the difference to the world they came in to do. All humans will, at some point, be shown their psychic potential and their spiritual ancestry by their guides. Those who fully awaken and become wayshowers to others will usually have agreed to do so with their soul family before reincarnating, so their resistance or surprise level will be low. Some will awaken and be frightened or overwhelmed, needing the support and guidance of people who know what is happening and can guide them through it. There is never any mandate to stepping into one’s psychic gifts; there will be no judgement from the Creator as everyone is born with free will. However, those who do will be fulfilling their soul agreements to help others to awaken and to serve humanity to the best of their ability, while also living their own lives and lessons out as planned. 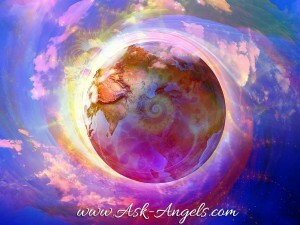 Psychic intuition and knowing is a birthright and not for the gifted few. There are many dimensions to the spiritual world and plunging into unknown territory without guidance is not recommended. If you are awakening to gifts you have been previously unaware of we, the Masters of Light, urge you to find a spiritual mentor or teacher to guide and protect you as you explore your gifts and the possibilities they offer. We also urge you to not be afraid, as fear will only block you and lower, rather than raise, your vibrations. The new energies now emanating from the Earth are fifth dimensional and the purging of old, dark energies continues to take place all over the world. Fires, floods and volcanic eruptions are continuously causing headlines, washing away or trapping past-life energies that have contributed to dark energies accumulating in pockets around the Earth. The influx of radiant light that is now bringing the Earth into a higher vibration has always been forecast and is a result of the constant efforts of Lightworkers and the Masters of Light who continuously send light, love and the Violet Flame out to the Earth and beyond. It was never forecast that the darker energies of war and terrorism would win the battle, even though it may seem like they are. We, the Masters of Light, ask you to hold the faith and to send as much light and love out to the world as you can, to anchor in the energies of ascension and to help to accelerate the ascension process. Purging very dark energies is never easy nor is it without consequences, which can include the loss of habitat for wildlife, homes for humans, livelihood and even the loss of life. However, the choices made by humans in the past have brought about this necessary cleansing that is paving the way for even higher, purer and magical energies. These energies will bring the Earth into greater light, aligning it with far-off planets and energies of the more-evolved beings that are willing to assist Mother Earth to achieve oneness and peace. Whether one believes it or not, all humans will begin to notice a change around them. Yes, those taken over by lower energies will still rage against the turning tide, but to no avail as the energies of Ascension continue to grow stronger and the awakening of the masses continues in greater and greater numbers. Dark energies come from a lack of connection to Source and stem from a lack of love for self. Now, more than ever, is the time for people to find their connection to their God-selves, to shed past trauma, stand in their I AM presence and to learn to love themselves again. If everyone in the world just did that, the changes on Earth would be immense, for when one no longer allows others to take advantage of them, to abuse them, to ignore them or to act in a superior way over them, the balance of power will be equalised and all will become one. There is no greater power than love, dear ones. Now is the time for all humans to come to terms with the fact that the reality they find themselves in is one they have created themselves with their thoughts and perceptions of themselves. The Law of Attraction is a powerful force for manifestation: what you give out comes back to you in equal measure. More importantly, the vibration of your thoughts affects the ascension process, because every thought goes out to connect with every other thought from every individual on Earth, creating a human collective consciousness that contains not only thoughts but the intentions behind them as well. The more positive they are with love as the intention behind them, the greater chance of turning the tide against the dark, negative and destructive thoughts of people who remain unawakened. The past is behind you and what is done cannot be undone. However, the energies created by travesties of the past can be purged. To lessen the need for cleansing on a catastrophic scale in the future, those who are awakened must work together to send light and the Violet Flame en masse. This can be done on the Crystalline Grid or through intentional group meditations. Call upon the masters of the Cosmic Council to help direct the energy to where it is needed and ask that the healing be for the greater good, but also done in the highest and best way. Stay grounded and clear your energies afterwards. Your help is needed and much appreciated.